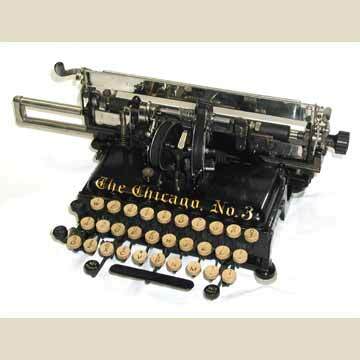 The Chicago 3 was a slightly slimmed down version of the Chicago that had been for sale since 1898. The most striking difference being the loss of the heavy cast iron frame around the keyboard. The Chicago 3 had two extra keys compared to the earlier and heavier model: a backspace (to the right of the space bar) and a key or margin release (left). Another major difference was the use of the standard, half inch ribbon on the Chicago 3, whereas the earlier model had used a wide ribbon. The operation of the Chicago 3 was similar to that of the regular Chicago. It had the horizontal type sleeve with the hammer that struck the paper from behind to push it against the sleeve, similar to the Hammond. Before the machine could be used, the typist would have to slide the rail holding the hammer out to the left to bring the hammer into position. The Chicago 3 remained in production until 1912.